A Mason jar is a molded glass jar with screw threads on its outer perimeter. It is widely used in canning to preserve food in our daily life. 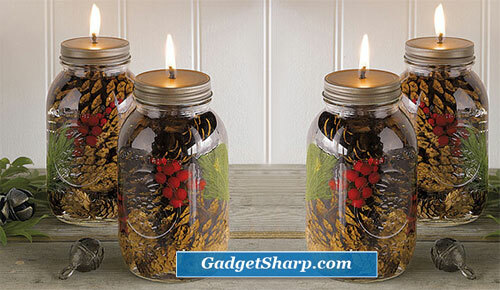 Due to its convient structure, there are many other products try to combine the features of mason jar with their own needs and create some interesting design in the shape of mason jar, such as drinking jars, oil candle jar. Take a look at the 7 Mason Jar Inspired Products in the post. And I have to see, have mason drinking jar at the picnic is a really awesome idea to avoid those annoying bugs. Featuring an innovative stand that doubles as a beverage tub,this drink dispenser is adorable and ultra functional! 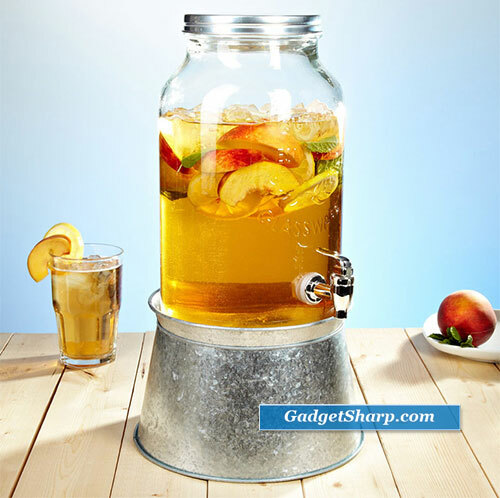 Crafted from high-quality, durable glass fashioned into the shape of everyone’s favorite glass drinking jar, beverage dispenser comes complete with a tin screw-on lid, plastic easy-pour spout, and galvanized steel base. The Guzzler is a 32 ounce Ball Mason jar with a metal lid and acrylic straw. Packaged in an open-face gift box, Red Nek drink ware makes a great gift. Guzzlers are dishwasher safe and made in the USA. 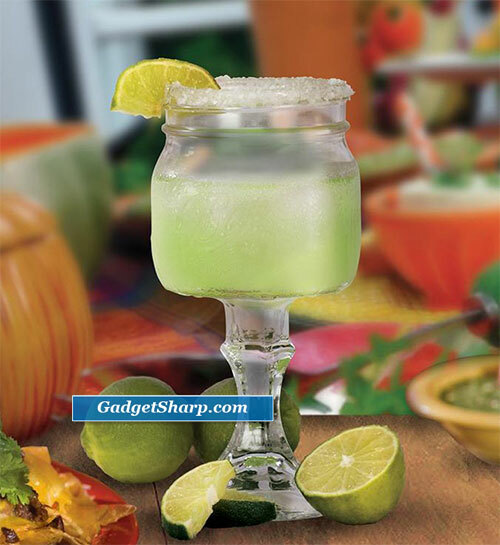 Enjoy summer’s favorite cocktail or other refreshments in this unique glass. These cool new Winter Forest Mason Jar Oil Candles are clean-burning oil candles infused with decorative pinecones, pine needles and holly berries all sealed up inside mason jars. They feature special fiberglass wicks that never need replacing, use smokeless, odorless paraffin liquid and have a 32 hour burn time. 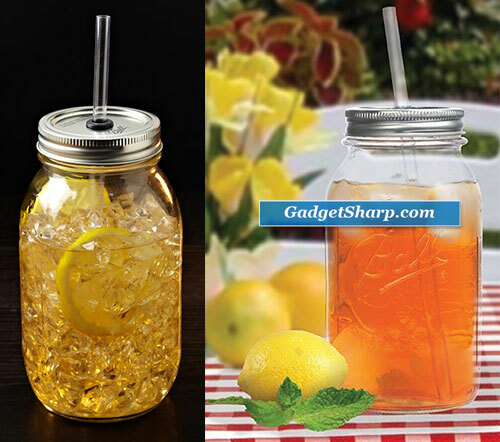 Perfect for old-fashioned iced tea lemonade or any refreshing drink. Attractive and sturdy with vintage charm galore. Go back to the days of listening to the wireless and drinking moonshine. 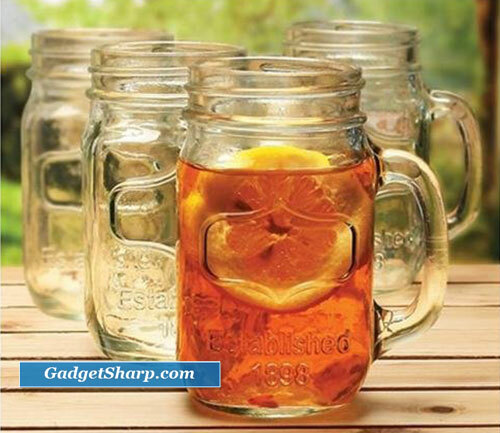 Set of four glasses each shaped like a Mason jar but with an easy-to-hold handle. Lead-free. Dishwasher safe. Please note lids are not included. 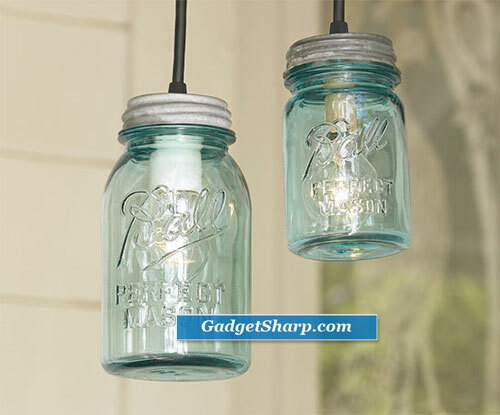 These vintage lights were handmade from blue-green Ball Perfect Mason Jars dating from 1910-1937. Each includes a vintage zinc lid, one 40W bulb, and a 10’ black cord. UL-approved. Made in the USA. 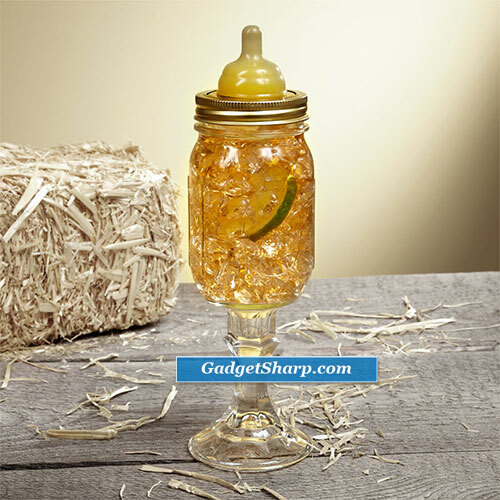 This baby bottle features a genuine ball mason jar gussied up with a glass stem so you can sip in bumpkin style. With a dunce-proof lid and rubber baby bottle top, you can sip out of this mason jar drinking glass while hanging the laundry to dry or chasing the children ‘round the backyard without spillin’ a darn drop!